Meeting the neighboursIf you remember the 1970s and 80s, you probably also remember Bhagwan Shree Rajneesh. He preached an alluring mix of Eastern mysticism, Western individualism, free love and personal enlightenment. An anti-establishment, anti-religious figure, Rajneesh developed a devoted following of orange-clad sannyasins who flocked to his Pune ashram. But relations between Rajneesh and the Indian authorities were difficult, and relocation was on the cards. 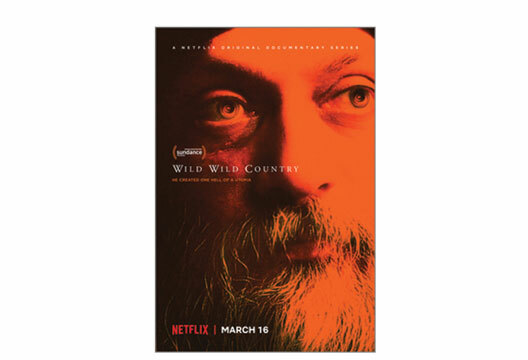 This is the starting point for the six-part documentary Wild Wild Country. In 1981 the Rajneeshees chose Oregon as their new home, bought a mas ranch, and moved in. It’s a smart choice by the documentary makers to enter the story here. We are in the same position as the white conservative population of tiny Antelope, the nearest town – the Rajneeshees were largely an unknown quantity. The townsfolk baulked at the enormous influx of mainly foreign people with a very different set of beliefs, and behaviour. At the same time, we see the incredible time, energy and feeling that went into creating the vibrant town of ‘Rajneeshpuram’ on this previously uninhabited land. Lines were rapidly drawn. The viewer wants to bang heads together – the Rajneeshees were arrogant and convinced of their rightness, the townsfolk rigid and judgemental. Rarely were ingroups and outgroups so quickly established. The documentary uses contemporary footage, intercut with interviews with the key players, including Bhagwan’s personal secretary, the charismatic Ma Anand Sheela. It’s Sheela around whom the narrative concentrates, as her influence expanded. It’s fascinating to see who changes their position from 30-odd years ago, and who keeps – or embellishes – their narrative. Everyone has had plenty of time to decide what story they want to tell. And what a story it is. Neighbourly discord is only the starting point, and things escalate, quickly and dramatically. Each episode brings a new revelation in the increasingly contentious relationship between the Rajneeshees and Americans. At the same time we are gradually exposed to details of life in Rajneeshpuram. As the energy and purpose of the early days fade, cultism comes to the fore: one daily ritual involves Bhagwan being driven slowly past the sannyasins in one of his 93 Rolls Royces. His inner circle jockey for power, and enlightenment and love fade to self-interest and hate. There’s plenty of psychology that can be applied to Wild Wild Country, but there’s more enjoyment to be had in simply sitting back and marvelling at the behaviour on display. Put your feet up… and binge.